To listen to an audio recording of this reading, click here. Summary: This Full Moon in Taurus supports the Heart’s life work in the “real world” that fully integrates the layers of the Self that have been discovered thus far. It also facilitates checking-in with the Heart for bucket-list items to plan for before the end of life, and lights a fire under such planning through a heightened access to inspired power. This Full Moon comes at global harvest time in the Northern Hemisphere. In the Southern Hemisphere, Spring is underway. It is either time to harvest what was grown in summer, or observe the blossoming of what germinated in winter. It is a time of fruition. In that spirit, this Full Moon finds some of the toughest work undertaken through Summer and Fall Tarot spreads having brought about genuine re-alignment and having landed in the physical world as integrated action/activity, as the Heart would hope it would. 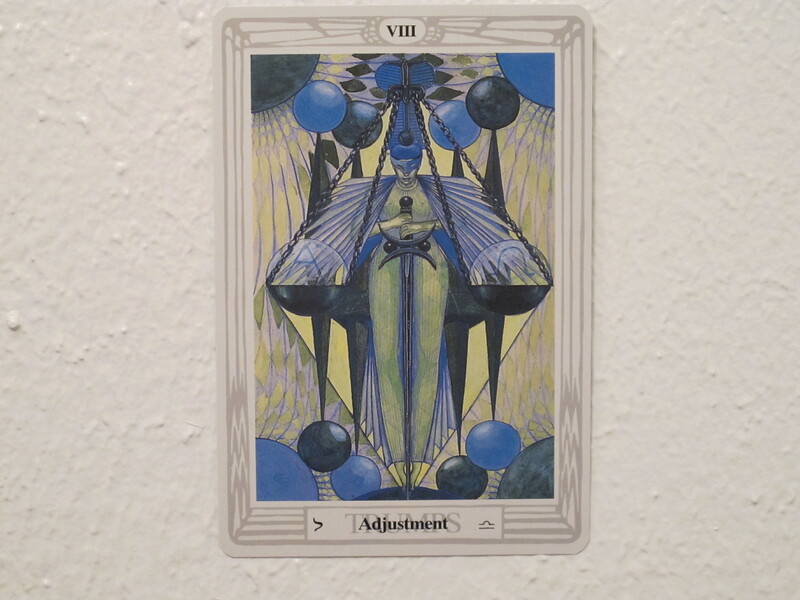 Trump VIII with Egyptian goddess Maat’s ostrich feather weighing the Heart’s freedom appeared in the New Moon Reading of July 15th (click to review). At that time, the Moon supported working through tough ruts to embrace the wisdom of the Heart (maat) as understood by ancient Egyptian society. Now, Trump VIII appears victoriously in support of the central card, the 3 of Disks, affirming that the Moon’s devotion was not wasted on any heart. 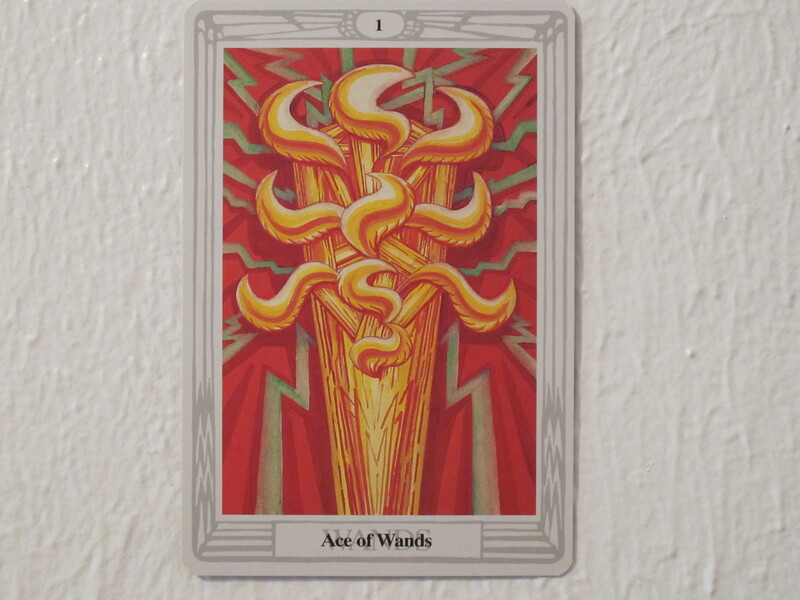 Similarly, the Ace of Wands with flames in the shape of the Qabbalistic Tree of Life appeared as the vision work guide in the New Moon Reading of September 13th (click to review). There also, the ruts the mind fell into when trying to “figure it all out” had to find relationship with the Seed to navigate life differently. Now, that cherished beacon of light appears still burning in solidarity with the central card, the 3 of Disks. How then, does the 3 of Disks represent what this Full Moon offers the Heart? The 3 of Disks’ astrological attributes are Mars in Capricorn. The image shows an aerial view of a pyramid, with red wheels (disks) spinning on the vertices of the base like helicopter propellers. They are forceful enough (Mars) to make the pyramid ascend and they leave a result on the physical terrain (Capricorn) by blowing the surrounding desert sand into dunes. The secret fuel of these powerful red propellers can be found in the glyphs in their centers which represent Mercury, Salt and Sulfur, the three elements of alchemy. 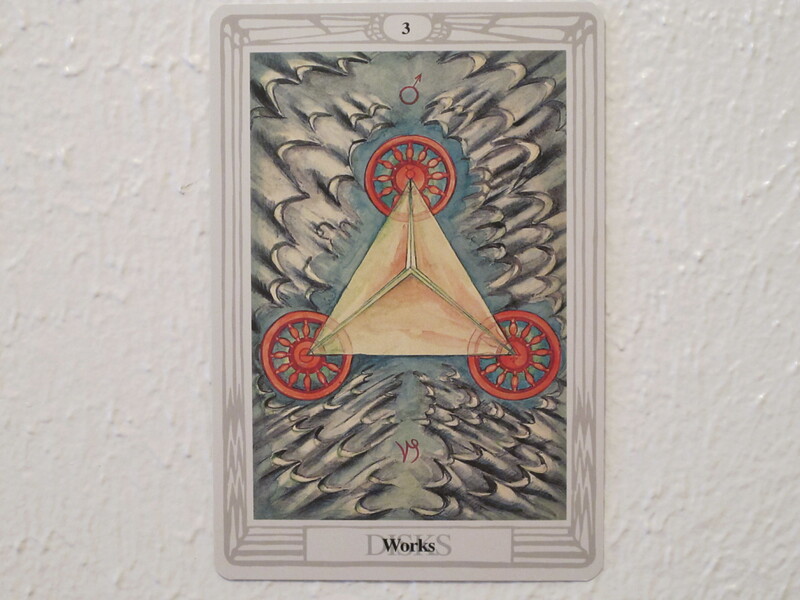 These three elements and their interconnection with each other are designed into the Thoth deck, emphasizing a balance of three key inner qualities as the foundation of external monuments. Here, the elements appear all together, functioning in synergy with each other. Thus, the layers of the Self that formed in response to questions about what one’s heart wants to feel now and at the end of life (Trump VIII) have been integrated into daily activity, however subtly that may be. Likewise, one’s connection to a source of inspiration (Ace of Wands) has also been integrated into daily activity. Even if the activity seems the same, the inner world packs a grounded feeling of empowerment (pyramid) which sets different results in motion in the “real world.” Additionally, the empowerment emboldens the Heart to continue to articulate its bucket list of states of being and modes of expression to step into before the end of life, without being inhibited by the mind’s inability to plan for it all. May the Moon and all beloved guides and spirits be welcome in the Heart’s foundations. 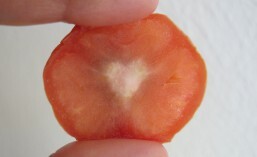 May the Heart celebrate their contributions with abundant gratitude. May this only be the beginning of irreversible transformation. May the briefness of life be the walking stick that helps the Heart to venture forth courageously. May it be so for you, dear reader. May it be so for me. May it be so for all our companions walking the journey all around the world. This entry was posted in astrology, full moon, spirituality, tarot and tagged 3 of Disks, Ace of Wands, astrology, full moon, Maat, ostrich feather, Thoth Tarot, Trump VIII. Bookmark the permalink.